"I was in love. I loved somebody so much, but I also realized I can never be what would fit into their life. How hard I tried, we were from different worlds, and there was nothing I could do about that." The entire album is an emblem of the confusions of entering true adulthood and re-experiencing the jolts of reality and despair that accompany adolescence. It&apos;s an incredible follow-up to Bury Me At Makeout Creek, her first studio release (and third album overall). Her ability to wield the guitar as both instrument of power and extension of her own vulnerability makes her a singer-songwriter of pure honesty, but not of the emotional vampire sort. She also has the best Twitter in town. 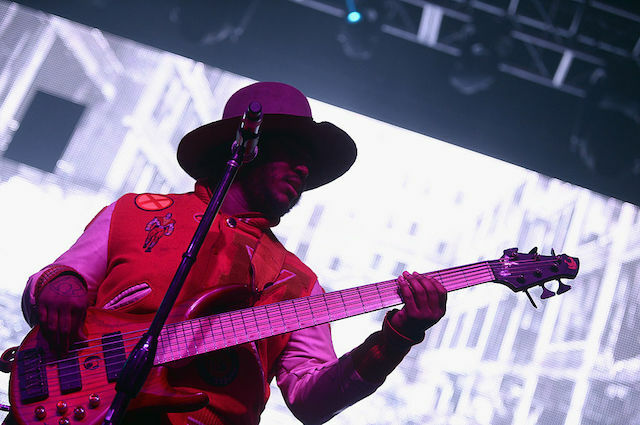 Thundercat is a true L.A. God, having held it down at Low End Theory since the beginning and contributing major production work to Flying Lotus and Kendrick Lamar&apos;s albums, as well as working as a session musician for countless others. His first solo album, The Golden Age of Apocalypse, came out in 2011, and his career has only risen since then. His 2017 release Drunk shows him at an exciting peak. The album combines his jazz, soul, and funk roots and his production style with a frenetic electronic pace and anxiety. It&apos;s also straight up hilarious. It elicits the laughter of rapture, awe, and stoned-out bliss all at once. He&apos;s a part of the jazz rise in modern L.A., which orbits the sun known as Kamasi Washington, so his set is guaranteed to both groove and surprise. It leaves a strong impression to have a Four Tet remix of a single from your debut album, and that&apos;s exactly Shura&apos;s story. Her track got the Kieran Hebden touch last year, and it&apos;s nothing but a strong accompaniment to her breakout effort, which is held up with dreamy, confident, and often melancholy 80s pop. She creates sonic spaces to lose yourself in, floating on the waves of emotional time capsules (fabricated or otherwise, does it matter? After all, nothing&apos;s real.). It&apos;s easy to assume she would get lost in the crowd of the resurgence of 80s musical aesthetics—so many synths and drum machines!—but her music pulls and bangs in a completely genuine way. It&apos;s a testament to the power of pop, and how it works best when in the hands of someone with a subversively grasp of its earworm power. The Pacific Northwest ushered in the feminist punk of riot grrrl in the early 90s, and while Sleater-Kinney and The Julie Ruin continue to kill the game, there&apos;s a new wave of feminist pop and punk coming from the chillier corner of the Best Coast. It&apos;s funnier, beachier, pop-ier, and mostly comes out of Sub Pop&apos;s sister label Hardly Art. Tacocat is one of the strongest bands in this wave of artists. They have tracks named after X-Files queen Dana Katherine Scully and the drudgingly awful experience of mansplaining, all while couching the humor within catchy surf rock. The band has a ridiculous amount of fun on stage and also has die-hard fans, so it&apos;ll be a damn good way to spend one of those mid-afternoon hours. They also partnered with local illustrator, animator, and gallery-owner Faye Orlove of Junior High for one of their music videos, so if that&apos;s not an L.A. seal of approval then who knows what is. Twin Peaks has been on the festival circuit for the past few years, reliably churning out damn-good garage rock with the energy and zeal of unrestrained youth. The four guys in the band scream and sweat on stage, reminding everyone watching of how much fun the guitar can be. Their most recent album release is 2016&apos;s Down in Heaven, which tones down some of their raucous energy while playing homage to to the rock &apos;n roll stalwarts of yore. There&apos;s less fight between the vocals and guitars, with a relaxed confidence of a group that has found comfort in growth. Whether they focus on earlier or more recent material, the set is bound to provide a perfect soundtrack to the desert. Jen Ferrer is the absolute last artist on the Coachella poster, but that doesn&apos;t mean she&apos;s worth overlooking. On the contrary, the L.A.-based DJ and label manager will be guiding the audience with groovy house, following the energy of the crowd as they start the final day of the festival. Ferrer doesn&apos;t release any of her own music, so her DJ power exists solely on the dance floor, making it a perfect opportunity to dive in to her set. She can masterfully create a dance or dark atmosphere and will be the perfect way to charge up for the day. Back on L.A. turf she DJs with Dublab and co-runs the Far Away party and mixtape series. Her Boiler Room set (below) is a great time and is the best way to get acquainted with her—check it out before heading to her set on Sunday.